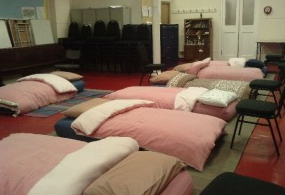 One of our biggest projects we are involved in every year is the Islington churches winter night shelter – 15 guests, warm beds, a hot meal and a cooked breakfast. It doesn’t sound too complicated, and it’s a privilege to be part of – thank you to everyone who helped out. A pleasure to help out and host. Enjoyed some really interesting conversations and the silver service and the delicious home made food made for a lovely evening with our guests.